The amazingly adapted Polar Bears - They're built for it! Polar bears roam the Arctic ice sheets and swim in that region's coastal waters. Polar bears love the arctic climate, where winter temperatures can plunge to - 45 °C (–50 °F). The owner of the business weather action, Piers Corbyn, says about the extinction of polar bear in the future. He explains, "Polar bears did very well in the warmer times. They didn&apos;t die out at all; they didn&apos;t die out in the last 10,000 years, nor during the previous interglacial, nor the one before that. So, they&apos;re just used as a deceitful heartthrob; you know, to pluck your heartstrings because the polar bears might die out." Polar bear&apos;s shocking whiteness, ferocity and sheer size make them icons of purity and power. Polar bears are attractive and appealing, but they are powerful predators that do not typically fear humans. 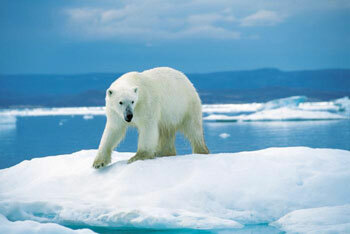 Polar bears(Ursus Maritimus) live only in the northern Arctic where they spend most of their time on ice floes. It is the world&apos;s largest land carnivore. They are well suited to the cold Arctic ice and snow. Life in the Arctic is harsh. The bears live in total darkness between October and February, where the temperature can drop as low as –50° F (–45°C) in winter. And that&apos;s exactly how they like it. The polar bear has many unique adaptations for dealing with the Arctic cold. Interior Skin of a Polar Bear Polar bears live in one of the planet's coldest environments and depend on a thick coat of insulated fur, which covers a warming layer of fat. How do Polar Bears keep themselves warm? Polar bears are warm–blooded mammals, yet they live in freezing Arctic temperatures. They retain their body heat because of a thick coat of fur as well as a thick layer of fat under their skin. Fur and fat are poor conductors of heat, or good insulators. A polar bear&apos;s fur is the first step in keeping warm. Polar bears actually have two types of fur: long oily guard hairs and short insulating hairs. 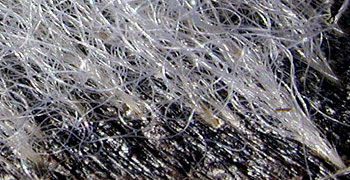 Polar bears stay warm by combining the properties of these two hairs. The guard hairs are actually hollow. These hollow guard hairs trap warmth and bring it close to the skin to help polar bears stay warm while also providing an oily outer layer which prevents the polar bear from getting wet. The insulating hairs help polar bears stay warm by trapping heat close to the skin. Under their fur, polar bears have black skin which is good for absorbing the rays of the arctic sun. Fur of a Polar Bear A thick layer of blubber ranging from one or two inches to four and a half inches sits just beneath the skin, covering all the bear’s muscles. Blubber is a layer of stored-up fat that acts as a blanket to hold in the bear's body heat. It can also be a source of stored up energy if the bear ever finds itself without an immediate food source. Polar bears are superbly insulated by blubber, the fat which is up to 4.5 inch thick. It certainly adds a layer of protection and can also be used for energy when food sources are minimal. Blubber also combines with the air trapping guard hairs to keep polar bears afloat in the water. The areas that lack the insulation are ears, tail and muzzle. These are especially small, minimizing non–insulated surface area to help prevent heat loss. Sometimes they cover their muzzles, which radiate heat, with their thickly furred paws. Scientists have also seen polar bears stay warm by using the snow. Snow crystals trap small amounts of air, and polar bears will burrow in the snow to create an insulating blanket which, while cold, is still warmer than the outside world. Exhausted Polar Bears A polar bear has to worry more about overheating than freezing. 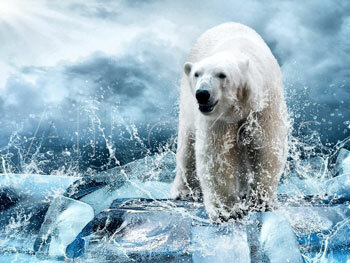 Even in very cold weather, a polar bear will overheat if it runs too far or too fast. Polar bears can sometimes actually become too warm because their bodies are so efficient at trapping heat. They move slowly and rest often to avoid overheating. Excess heat is released from the body through areas where fur is absent or where blood vessels are close to the skin. These areas include the muzzle, nose, ears, foot–pads, inner thighs, and shoulders. 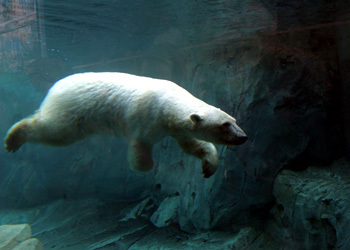 Polar bears will also swim to cool down on warm days or after physical activity. Polar Bears of different colors Polar bear fur looks white but really isn’t. When sunlight hits the body, the photons of each wavelength rebound through the hair and is scattered by the air pockets until they shoot back out again, making the animal appear to be covered in white fur. Is a Polar Bear really white? Polar bears fur consists of a dense, insulating undercoat topped by guard hairs of various lengths. Polar bears do appear white to us. But there is more to this than meets the eye! Polar bears appear white, but their fur is not white. 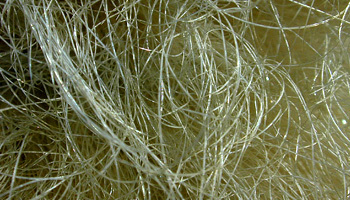 Each hair is made of keratin, the same substance found in our fingernails and hair. 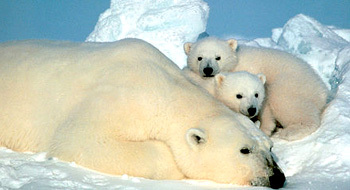 However, polar bear fur is transparent with a (air–filled) hollow core. Reflection of the sunlight from the densely packed transparent hairs makes polar bears seem to be white. The keratin that makes most of the sun&apos;s rays reach their black skin to absorb heat and which in turn provides extra warmth for the skin. The bear&apos;s stark white coat provides camouflage in surrounding snow and ice. Scientists used to think that polar bear&apos;s hollow hairs acted like fiber optic tubes and conducted light to their black skin. In 1988, Daniel W. Koon, a physicist and graduate assistant, Reid Hutchins, proved this false. Their experiments showed that a one–fifth inch strand of polar bear hair conducted less than a thousandth of a percent of applied ultraviolet light. So, the black skin absorbs very little ultraviolet light. Instead, Koon believes keratin, a basic component of the hair, absorbs the ultraviolet light. Oily outer layer of Polar Bear They have two types of fur: long oily guard hairs and short insulating hairs. 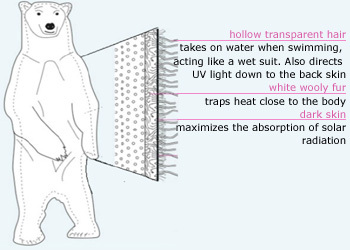 The hollow guard hairs are used to trap warmth and bring it close to the skin while the oily outer layer prevents the polar bear from getting wet. Since the Polar bears have fur that is made up of "hollow guard hairs", polar bears living in zoo&apos;s that are in a warmer climate, can have algae growing inside the hollow guard hairs of their fur. This makes them have a greenish tint to their fur. These hollow hairs also keep their hair from matting down when they swim in water. Polar bear fur is oily and water repellent. The hairs don&apos;t mat when wet, allowing the polar bears to easily shake free of water and any ice that may form after swimming. Polar bears gradually moult from May to August, but, unlike other Arctic mammals, they do not shed their coat for a darker shade to camouflage themselves in the summer conditions. Polar bears look whitest when they are clean and in sunlight, especially just after the molt period, which usually begins in spring and is complete by late summer. Before molting, oils from the seals they eat can make them look yellow. Swimming Polar Bear Polar bears are strong swimmers; they swim across bays or wide leads without hesitation. They can swim for several hours at a time over long distances. They've been tracked swimming continuously for 100 km. Polar bears have paws specially adapted to meet both terrestrial and aquatic demands. They are Large, wide, and flexible and spread outward to distribute weight over a broad surface area, thereby easing travel over snowy and icy terrain. In the water, the wide surface area provides a paddle–like effect, which is enhanced in the forepaws by webbing between the toes. The hind feet and legs are held flat and are used as rudders. These adaptations enable polar bears to swim using a dog–paddle stroke, with front–to–back limb movements within the limits of leg and joint anatomy. A polar bear&apos;s nostrils close when they are under water. They can remain submerged for as long as two minutes. They can swim for several hours at a time over long distances. They&apos;ve been tracked swimming continuously for 100 km. The thick layer of blubber (fat), keeps the polar bear warm while swimming in cold water. 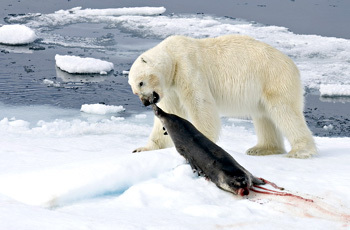 Polar Bears hunting for their prey The polar bear's main prey is the ringed seal. Polar bears usually hunt ringed seals by waiting for the seals surface to breathe at openings (leads) in the ice or at breathing holes called aglus. In the Arctic, polar bears top the food chain. Both males and females hunt, and their favorite meal is seal, especially a ringed or bearded seal. When hunting&apos;s especially good, they&apos;ll just eat the seal&apos;s fat, which helps build up insulation. While polar bears prefer seals, they&apos;re opportunists. They&apos;ll eat anything from beluga whales to walruses. The bears can find food on land if they have to, attacking reindeer and raiding bird&apos;s nests (bird eggs are a favorite snack), but they aren&apos;t well–adapted to hunting on land. Still-hunting Polar bears "still hunting" on the sea ice – waiting for an opportunity to grab an unsuspecting seal as it surfaces to breathe. A hunt starts with a scent. Polar bears can smell seals up to 20 miles (30 km) away, often by the scent left on their breathing holes. The Arctic is home to millions of seals, which become prey when they surface in holes in the ice in order to breathe, or when they haul out on the ice to rest. In the fall, when the ice is softer, seals cut holes in the ice so that they can come up for air when they need to breath. Polar bears find such breathing holes and wait, sometimes for several days, until a seal comes up for a breath. Polar bears hunt primarily at the interface between ice, water, and air; they only rarely catch seals on land or in open water. 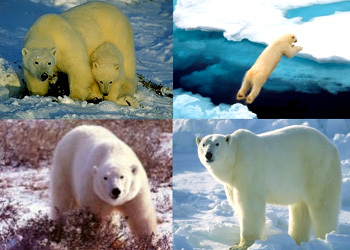 The polar bear&apos;s most common hunting method is called still–hunting. When a polar bear spots a seal coming up for air, it gets down on all fours, delicately putting each paw on the ice to keep silent. The bear then makes a shallow dive through the hole to grab the seal with its claws. Those sharp, 2–inch claws grip the seal extremely well. Still, seals sometimes get away. Polar bears have been known to get upset when they lose their prey, pounding the ice or throwing blocks of it in a sort of tantrum. When the hunt is successful, a bear will share a kill with others as long as they beg properly: keeping low, circling the kill and occasionally nudging the hunter with their noses. Polar Bears hunting seals Seals make multiple breathing holes in the Arctic ice to avoid attack by a polar bear when they need to resurface for air. Hunting is a waiting game for the majestic ice bear. Fish and other marine animals make the best meals. The polar bear also hunts by stalking seals resting on the ice: Upon spotting a seal, it walks to within 91m, and then crouches. If the seal does not notice, the bear creeps to within 9.1 to 12 m of the seal and then suddenly rushes forth to attack. A third hunting method is to raid the birth lairs that female seals create in the snow. A widespread legend tells that polar bears cover their black noses with their paws when hunting. There is no record of an eyewitness account of the behavior in recent decades. Dr. Ian Stirling and several assistants used telescopes to watch undisturbed polar bears hunting seals in the Canadian High Arctic, 24 hours a day when conditions permitted, in both spring and summer conditions, for several weeks each year for several years. They documented the details of many hundreds of hunts. No bear was ever seen putting a paw over its nose while stalking a seal. Nor, have other polar bear biologists, ever observed this behavior.